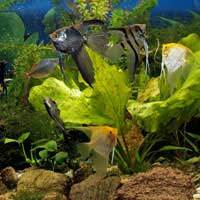 Most articles about fish advise you on how to keep them in ideal environments. But sooner or later you may need to transport your fish, and this is never ideal. It's important to know what you can do to minimise the risks involved. They have to travel from the shop where you purchased them to your home. You're moving house and they need to travel with you. They need to visit a vet or fish health specialist. You are trading or giving away your fish. You are exhibiting your fish in a show. You are introducing your fish to somebody else's for breeding purposes. Increasingly, fish shops are able to arrange specialist transport for fish to your home. Where available, this option is almost always worth taking. If it is not available, plan your journey carefully to minimise the time your fish will spend being moved and to make its journey as smooth as possible. The ideal way to transport fish, and the only way to do it if the journey is a long one, is using a special transport tank. These are metal containers with valves for cycling oxygen. They can be expensive, but they will keep your fish in good condition, minimising stress, and they're re-usable. If you're transporting fish over short distance (with journey times of less than an hour), the best thing to use is a plastic bag. Don't use supermarket bags for this - they're less sturdy and may leak toxins into the water. Your local fish shop will be able to supply you with something suitable at a very low price. The bag should be filled about halfway up with water and the upper part should be inflated with air or, ideally, pure oxygen (available in canisters from specialist shops). This will ensure that your fish can breathe properly throughout the journey. Bear in mind that the warmer the water your fish needs, the less oxygen will be available in it, and the shorter you should aim to make your journey time. Never just dump fish bags in the back seat of your car. At worst you should have somebody there to hold them upright. The best way to transport bags is to build a box for them out of old pieces of polystyrene. This will provide both support and insulation, helping to keep the temperature steady. Although a plastic or metal box might seem like a better idea than a bag, because it's sturdier, it's usually a bad idea, as frightened fish can injure themselves when bashing against the sides. There are several things you can do to minimise the stress your fish experience when being transported. This isn't just a matter of being nice to them - it can have a serious effect of their health. Frightened fish tend to urinate more than usual, which means ammonia can build up in the transport container, poisoning them. You can reduce the risk of this by adding a special anti-ammonia agent such as Kent Ammonia Detox or AmQuel. You should also add antibacterial medication to reduce the risk of stress-related and injury-related infection. ParaGuard is a good choice because it also kills parasites and improves the mucous coating which protects your fish's skin. Fish, like most animals, are generally calmer when transported in the dark, so if you're using a clear plastic bag find something to cover it with. When checking on them, try to look from the side, not directly above or below, as the latter are the directions from which predators are more likely to approach and fish are consequently more nervous about them. Finally, make sure you've done your research on the type of fish you're transporting. Some, such as neon tetra, are highly gregarious by nature and will feel much safer in a group. Others, such as angel fish, are likely to become aggressive if kept together in a confined space and may injure one another, so it's better to transport them separately. Transporting fish can be a bit of a nightmare, but with careful planning and proper attention, there's no reason why it shouldn't go smoothly for all concerned.